Aptly described as “Surrealistic comedy that bends the edges of logic in any particular direction with enough grace that you truly don’t know what’s coming next. 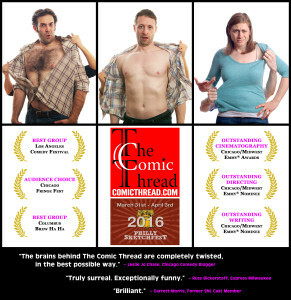 And you really don’t care because there’s a 90% chance that it’ll be exceptionally funny,” (Express Milwaukee) The Comic Thread prides itself on unique characters and regularly ventures into ridiculous territory without a hall pass. Saturday, April 2nd 8:00pm at Johnny Brenda’s with Kathryn & Sarah, Pure & Weary and The Incredible Shrinking Matt & Jacquie.